Someone named Laura disagrees with me, but I have long maintained that the best dive fin ever made is the Apollo Prestige. I love it for many reasons. 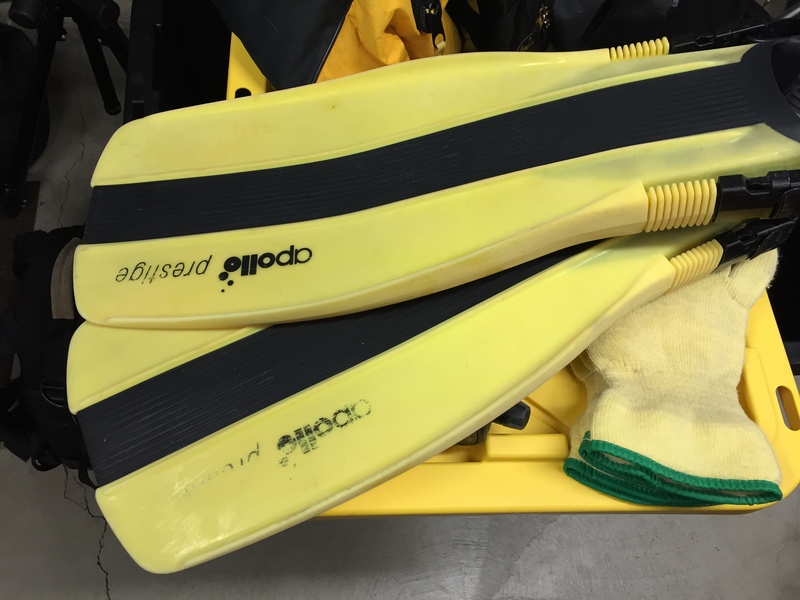 Being made of monoprene, as opposed to polyethylene, it a not only more durable than most dive fins, but also much snappier. That means when you put force against the blade, it will straighten out much more quickly. A rubber strip down the center of the blade helps channel water in one direction. To the diver, that means the fin will react quicker and respond immediately to more subtle input from the diver. For me that’s crucial. I rarely butterfly kick, so I tend to push off the bottom of the blade as much, if not more, than I do the top. Regardless, the Prestige has a built-in recoil that tends to provide momentum after even after leg movement has stopped. This is because the blade is still straightening out for a few fractions of a second. Other materials tend to be too flimsy to provide any additional thrust, or too stiff to dive comfortably. For a while I dive with ScubaPro Seawing Novas, and find them pretty okay, but they have a bizarre feel from the hinging action between the blade and my foot. They are also a monoprene fin, so I had high hopes. I do love the straps and foot pocket at least. Long ago, Dive Rite bought the molds from Apollo and produced their version of the Prestige using some other plastic. To suggest that they sucked is beyond an understatement. So, I wasn’t taking any chances when they announced switching to the original monoprene. I think that took place with whatever model was offered prior to the XT. 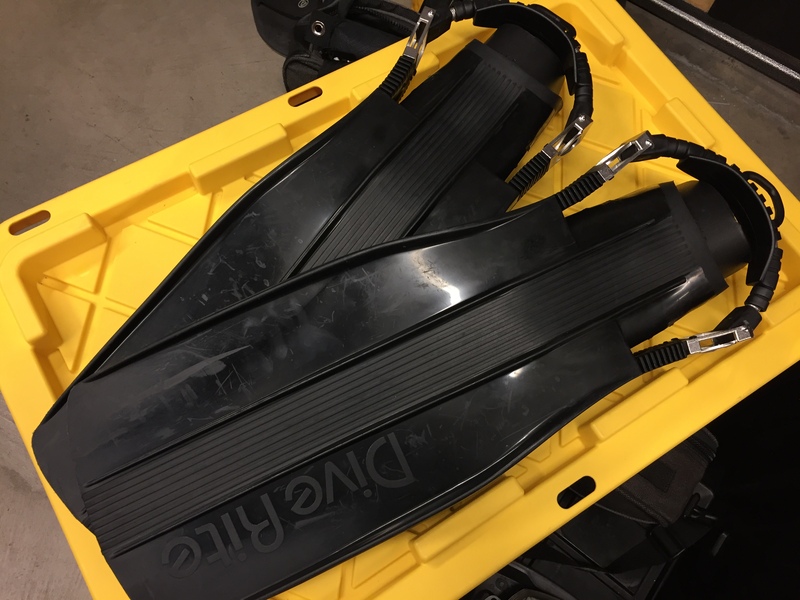 Nevertheless, I needed to see and feel them in person before I would throw out $145 at another pair of Dive Rite diving fins. I had that chance at last year’s DEMA show and finally got around to buying them about two months ago. Since then, I’ve done probably 30 dives in them. First of all, YES, the Dive Rite XT feels just like diving the original Apollo Prestige! I wasn’t sure if I’d like the spring straps, but it turns out they are great. I love them, although I had to adjust my donning technique a little, and the way spring straps are made makes it harder to carry your fins in one hand. They’re just thicker and don’t flex like a rubber strap. I had to deal with the same thing getting used to the ScubaPros. That last point may sound silly, but try carrying two stage/deco bottles in the same hand as your thick, inflexible fin strap and you see what I mean. It’s doable, but takes some thinking ahead before trudging into the water. So, except for Laura, I highly recommend the Dive Rite to any diver who wants an ultra-responsive fin that delivers lots of power when needed, without fatigue issues. The only bummer is Apollo was made in USA. Dive Rite XT is made in China. This entry was posted in New Dive Gear, Technical Diving and tagged dive fins, diving equipment, tec gear, tech gear. I will agree with the author, The Apollo Prestige is my favorite fin. While I have since retired, I would highly recommend them or something like them. A commercial diver for years and I was very disappointing when Apollo switched to the split fin. I had literally worn out 5 or 6 pairs of the Prestige and was more than happy to keep paying the $200 a pair for a new pair every year, because they were so comfortable and easy to kick for hours and hours on end. I actually called them and all but begged them to make me a pair. I quickly informed them that the new split fin was junk for a working diver. The lady on the phone said the mold for them was for sale and that I could buy the mold and make my own. I ended up settling for a Mares hinged flipper that was ok, but nothing ever compared to the Prestige.